* Nothing is more cruel than dreams coming true. Overview and notes about cruising and harbours click here. 12 o'clock. Wind, E then S, 13 then 25 kn Kaat is coming back from the fitness session, organized by the wife of the marina manager twice a week. She does also some shopping. 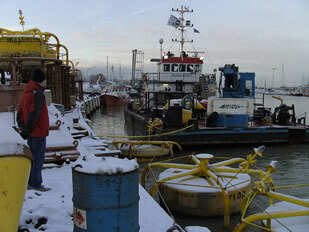 The daily routine starts again, now that we are back in the marina. Not a unpleasant change - really not, we think - after our five months trip. Eric has already updated a part of the website, but he has still a lot of text to write for the French and the English pages ... And we have to complete the photo album. A good shower will refresh his inspiration. 1 p.m. Rain and thunderclouds are huddling ... Light south wind. Some drops. Suddenly a violent gust, strong southerly winds. 3 p.m. Heavy rain. Ink black sky. We think it is better to disconnect the electronics - that will make the fourth time! In all its intensity the thunderstorm breaks loose. Violent. Lightning. Orange and blue flashes. Hissing crackles. Deep rumbling of thunder. Shrill, too. Violent bangs. Impacts of mortar. The wind howls. Torrents of rain. 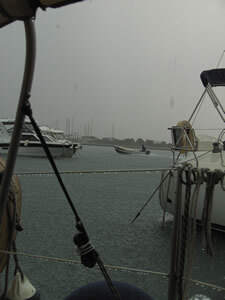 We connect the anemometer - just for a moment - 31 kn A lot of sailboats are entering the marina. 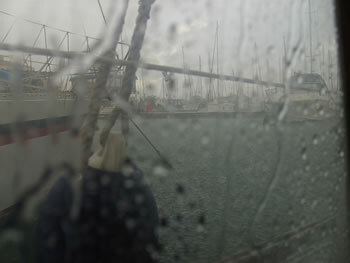 Through sheets of rain - the visibility is now very bad - the sodden marina staff is trying to direct the boats to free berths. Intense and rough waltz of the marina dinghies. 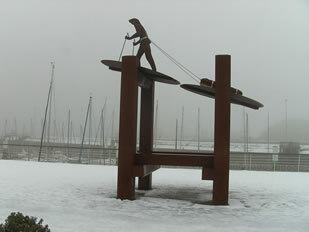 The gusts are sometimes so violent that some skippers do not dare to moor. They wait. Many charter boats, too, appear at the entrance. It's Friday afternoon: time for the crew change. After two or three weeks, for most of them, it's the end of expensive holidays... North wind, now. Meanwhile, the flotilla season runs to the end - finally, because it was still very busy mid-October! 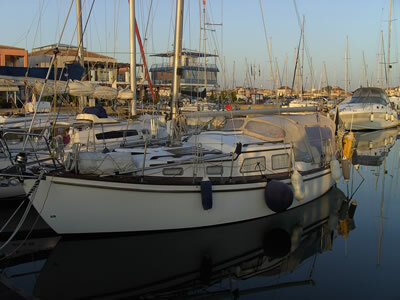 The marina regains its quietness and becomes mainly neater. But to many times the weather is the poor factor. 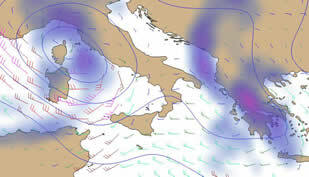 Serious perturbations associated with lows in the central Mediterranean Sea are regularly moving over Lefkas. 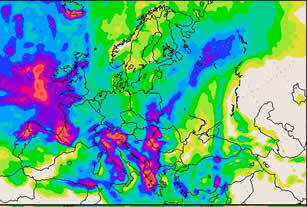 After a wet month of September, October till today counts more days with rain than without. The heavy rainfall is usually associated with thunderstorms as the cold air masses are sliding over the warm sea and the land, providing very spicy effects, still reinforced by the mountains. The elections of October 4, gave the Nea Demokratia (N.D.), the party of resigning Prime Minister Karamanlis, a resounding defeat. Big winner is George Papandreou; with his PASOK party: he obtains an absolute majority in parliament. Kostas Karamanlis did with early elections a desperate attempt to find an exit out of the political impasse and of the non-govern by his government, weakened by numerous corruption scandals, while Greece was descending further into a deep financial, economic and social crisis (GDP deficit in 2009 12.5 %). Surrounded by a group of younger politicians and with a promising program Papandreou could win the voters for him, partly at the expense of other leftist parties including the more left Syriza-coalition, while Karamanlis also lost on his right side to the LAOS party. Despite a certain plebiscite and the high score of PASOK - 160 seats with 43.92% of the votes to 33.48% and only 91 seats for the N.D. - these elections had a high degree of resignation, which brought some commentators to consider the victory of Papandreou more as the result of the rejection of Karamanlis and his Nea Demokratia than a genuine belief in the PASOK program. This program is so ambitious that it is right to doubt whether this is not too ambitious, or - and we are aware about our question - if Greece really can handle such profound changes and ... really want them! However this new social-democratic government gets generally much credit. Also in the economic world the attitude is positive. In all modesty, we like to join it! During spring we have been there already for a checkup. We were pleasantly surprised about this modern dental practice that a, in the United Kingdom trained and in dental implant specialised, couple of dentists has opened here in Lefkas At the end of the return trip from Hortó Eric had some problems with a sensitive tooth. A root canal treatment is necessary to preserve - absolutely - the tooth but in this case the intervention will be particularly complicated and our dentist sends us to a colleague specialised in endodontics. 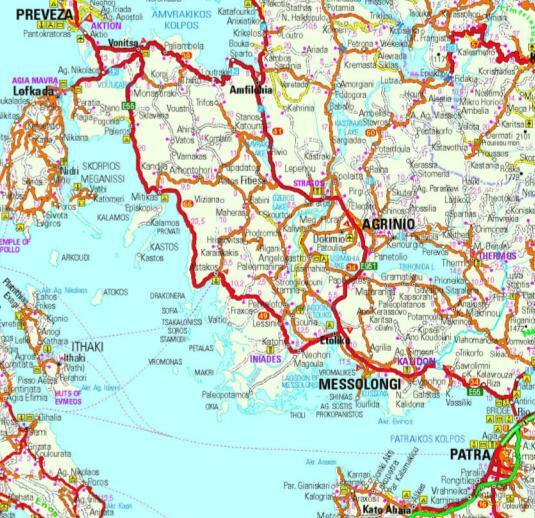 For this we need to go Patras , at more than ... 200km. But we decide to make the best of a bad hand: it will be an opportunity for a new experience in dentistry in Greece, again we will drive through new places and now we will pass the new bridge of Rio-Antirrio driving over it instead of sailing under it. We'll have to go twice to Patras. Because going by bus will not make things easy, we rent a car for some time being thus much more mobile. My first appointment. 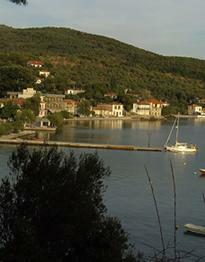 The trip goes via Vonitsa, then along the great inland sea - the Amvrakikos kolpos - to Amfilochia. There we have to turn south-east. A very recently opened stretch of the future Ionian highway connecting Patras and Athens to Ioannina more in the north allows us to avoid the very busy and unpleasant road via Agrinio. In Ioannina the motorway will be connected - when finished - to the west-east highway Igoumenitsa - Alexandropouli, near the Turkish border, which opened a few months ago. In Ellenika we reach the old two stroke-road to Athens. Driving here quite close along the north of the Patraikos Kolpos and approaching the large and impressive bridge we get a beautiful view of the gulf. The passage fees are 11.70 euros. Really not as elegant as the viaduct at Millau in France, we are thinking again. Patras, 174.000 inhabitants. Patras, the city that never sleeps and where traffic never stops, we read in our Guide du Routard. We are quite fast in the hellish traffic although while we are on the Fast road leading us directly to the heart of the modern city, the harbour, we can breathe easier. We succeed - only after driving some circles - to find a parking to get rid of our car during a few hours, for 6 euros. We are a little too early and it's nice weather: on a terrace at one of the busy squares the city counts, at Olgas Square - Platia Olgas - we can relax. This part of the city is a patchwork of rather narrow and very similar streets, perpendicular to each other. The buildings are fairly uniform, apartment buildings of four or five stories. The ground floor is always occupied by shops, bars and restaurants. We notice a large number of nice cloth shops and chic boutiques; a number of new fast food restaurants. There are a lot of people on terraces and in the cafés. Korinthou, one of the main streets of Patras, a few minutes walk from Platia Olgas. At 10.57 a.m. we arrive at the five-store , apartment block, looking dull and little dingy, where we should be. A gypsy woman with several young children is sitting on the entrance steps. Many times we have noticed that the Greeks are tolerant towards beggars. An indifferent tolerance that doesn't prevent them to have a positive response when solicited, but nothing more. Tolerant also towards the Roma, quite numerous in Greece; they often travel around selling their goods, from village to village. Not by the lift but by the little dark stairs we reach the first floor. We ring. Behind the massive and blinded door of the dental surgery we enter in a very tastefully decorated waiting room. Yellow ocher, soft leather seats and a glass table, on which some magazines and look books; on the wall a plasma screen on which a National Geographic program is broadcast. We have just flattered down in the comfortable seats when a smiling, nice young assistant of the dentist appears asking us in neat English to be patient, for some moments. At exactly 12 o'clock, just after the next patient had arrived, we leave the office, led out by the assistant, who wishes us a good trip and reminding us the second appointment. I am still a little impressed by this first treatment when am telling "No, I've felt no real pain, sometimes a pressure [...], yes, of course, that long time with gaping mouth is little difficult and annoying the second injection at the inside of the gum [...]. Yes, here too, the treating tooth has been completely isolated [...] first, the dentist has put a kind of a clip, then a thin soft rubber screen over my whole mouth [...] A friendly, very nice man, rather young [ ...]. Very much routine, everything very coordinated ... they were three, yeah, two assistants. [...] A very good impression, very driven in his work. [...] A completely new equipment, at many times he was working with a microscope. Really very high precision. [...] Yes, he speaks very fluent English. But most of all, his drive makes impression, and his penetrating gaze, but always with a smile ... "
We go to the yacht harbour, where we never have been before. 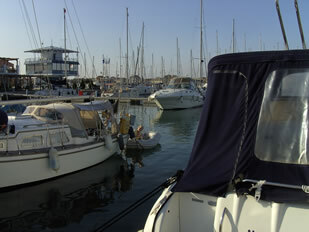 The nice weather and what we believe to be considered as lunchtime make it very busy in the large bars along the marina. We walk to the three docks . 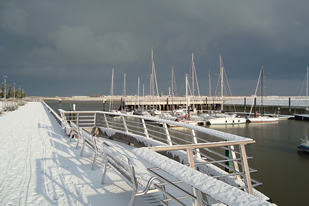 The first two are almost fully occupied by local sailing boats, the building of the sailing club with a restaurant nearby, is located just behind the first, the most northern dock. The visitors pontoon is located in the most southern part of the yacht harbour, which is also closest to the ferry harbour. 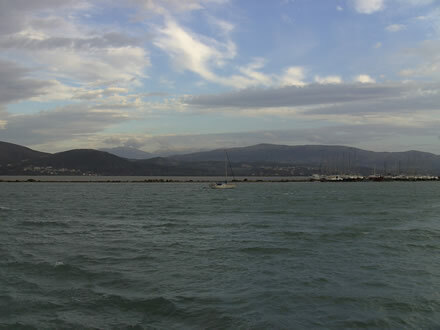 At every berth there is water and electricity, but the whole marina does not seem so sheltered by strong winds, especially from the west and the north. 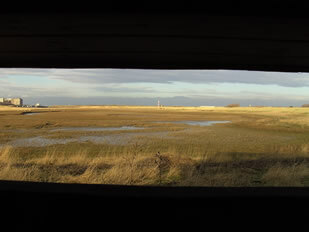 But today there is no wind and thus also at the visitor pontoon looks comfortable. Crossing again the Promontories bridge we return in the direction of Alfas via Mussolini. The section of highway under construction is only open in N-S direction so that the coastal road from Mussolini to Stakes and Palpations is a pleasant alternative to the tedious return along Marino and Mafiosi. Stakes was a possible stop on our return trip from Horton. But then we opted for a crossing to Va thy on Yitzhak. Now we would like to have a look at Stakes. We go by the salt pans of Mussolini, by Netlike, Anechoic en Pedal. This is the plain of the River Bachelors. An amazing project wanted to move the headwaters of this important watercourse to deliver more water to the heavily subsidized cotton fields in the north. This unecological and most absurd plan is now apparently abandoned by the new government. Meanwhile my anaesthesia is almost worked out so we could eat a bit - it's now about 3.15 p.m.. Astakos is really disappointing: sloppy and deserted, no really nice tavernas but big restaurants with ... empty terraces. Despite the nice weather we get not enthusiastic.The only small restaurant that we necessarily pick out is finally worth nothing: Kaat doesn't touch her almost completely charred Bifteki while it's very hard for me to eat the tsaziki with to big cucumber cuts - the only food I should be able to eat. The harbour - in fact only a quay open to the south and a pier - where two work ships for the fish farms and four sailing boats are moored, is also disappointing. We decide not to stay any longer and to go to Pálairos, at 54 km. The main part of this coastal road, with very little traffic, is bordering beautiful bays. Especially the view of the numerous islands , the small ones - around N. Dragoneira -, the medium ones - Atokos, Kastos, Meganisi - and the bigger ones - Ithaka, Kefallinia and Lefkas - is very beautiful. In a few bays we see fish farms of which the culture pools marked by large floating buoys marked prevent any access. In the harbour of Pálairos, where were already in spring, two sailboats and some foreign individual charter boats are moored at the concrete quay. On the wooden floating pontoon with water and electricity facilities, that kept our attention by our last visit - it was empty at that moment - is now a whole fleet of sailboats from a charter company. Pálairos isn't unpleasant and at a quiet terrace we order coffee and fresh orange juice, combining business with pleasure, because, after all, these drinks are comparative price indicators. 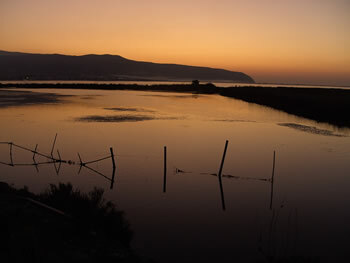 At dusk we return to Lefkas by the road through "the ghost village" Palia Plagia. 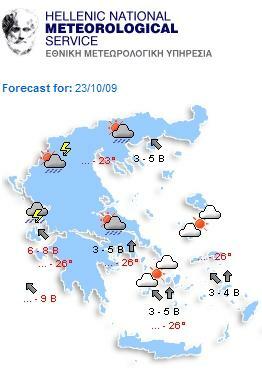 By this event, one week later, we get quiet different weather: heavy rain in the early morning; in Patras, squally showers, a little later on, rainy, then bright intervals, finally it becomes sunny - at that moment it's about 1 p.m.. The W to NW-ly remains very strong. 09.45 a.m. On the motorway even less traffic than last week: we haven't seen a single car! Patras also shows a different look. No people on the terraces but in the cafés and bars it's very busy. We wonder how this can be on a Tuesday morning ... and while the current prices are very high relative to the wages! The intervention of the endodontist happens as smoothly as at the first visit. 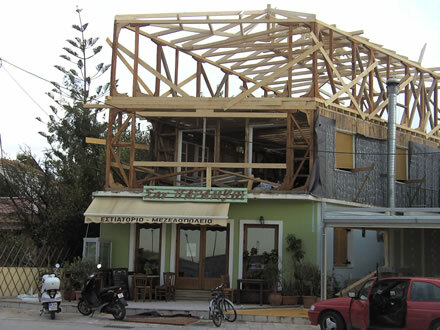 One hour later , it's up to my dentist in Lefkada to finish the job. After paying the fees the assistant gives me a letter for the colleague and detailed information and statements for the Belgian social security and the health insurance. This time again we have seen the other face of this country. The Greece of rather young enthusiastic people who - the ones with a very high degree of training and specialization, the others with kindness, good communication and good technical background - can compete with their equals in all countries of the European Union where they belong too. This Greece is not the country that the tourist brochures as a low cost destination like to promote with all negative consequences. Those people are aware of the problems their country is facing. Sailing here a defined trip on a small sailing boat, gets curiosity but sometimes also people are worrying about your opinion. So, I had a short conversation after the treatment about things going on. I didn't hear the so many times used answer "what can you do? This is Greece!" From our second trip to Patras we also take the opportunity to visit the harbour in Mesolongi The works in the new marina are well going on - there is now electricity on all pontoons and all berths along the quays have power supplies. We observe again the relative large number of boats that will winter here. Several boat owners we met during our summer trip, have chosen for Mesolongi, as our French friends Guy and Martine. This new marina-in-works has certainly now a number of assets, particularly including the rates ... if the wintering people have transport. We think that having no car can be difficult. Kaat has thoroughly perused the road map. She wants to make also a stop at Mytikas. In the evening light, the view on Mytikas from the coastal road to Pálairos just before Akra Kamilafka, is very beautiful, a true postcard, but when we are entering the village the disappointment is all the greater. It looks like the many chaotic and unfinished buildings, but also the new small flats, are put down before thinking about the streets. The old town part looks also dingy. Only the pedestrian street near the harbour has some character. The harbour consists of two parts but small local boats and a small tourist boat are taking all the space. A wooden pontoon in the middle of the east dock is largely limiting berthing; a sailing boat moored alongside is also taking all the space - but we think that there is no other solution. We take the same road to Pálairos but then we go in the direction of Vónitsa until we can turn left to Agios Nikolaos. Hence it's still 10km to Lefkada. The floating bridge - the Santa Maura ferry - between the island Lefkas and the mainland, is opening on the hour, it is therefore important if we don't want to wait, to avoid arriving then. The more we succeed. when most tourists are gone! Crossing the high "inland" to Agios Donatos, it's always a nice experience. The autumn colours, though less rich in nuances than in our countries, are making the trips always completely different. During the few real nice days of October , the car takes us also several times to Agios Nikitas, where we reach after a steep climb and the same descent the beach of Mylos. Except some rare late sun lovers, we have this very beautiful beach with its thick white sand just for us. 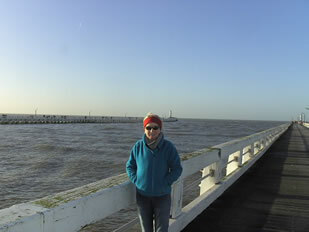 In contrast to our visit in the spring - and to almost the end of April - the water is very nice. We enjoy very intense those beautiful but rare late summer days. Several times, we also visit the pleasant and good restaurant - The Katoghi - Peter and Alison have opened in the spring in Vafkeri. A major challenge, but now after a very good first season, they can look to the the future with greater confidence. 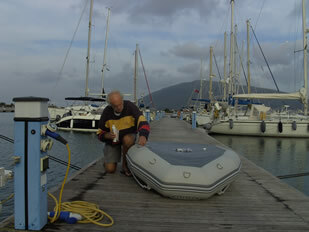 01.11.09: Lefkas Marina. Nice but cool weather - 14°C at midday today. In fact we get better weather since a few days - finally! -, since October 28th, the second national holiday in Greece (1940: the Italian invasion led to the resistance against Mussolini's ultimatum and defeat of the Italians, the Germans in 1941 attacked Greece): that day it was sunny with temperature about 20°C at noon. 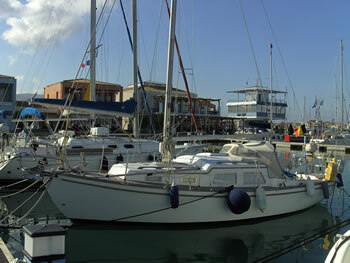 03.11.09: Lefkas Marina. At 7.25 a.m. (05h25 UTC) an earthquake of 5.7-5.9 (Richter scale) created some anxieties at Zakinthos en Kefallinia (www.iris.edu/seismon & http://www.emsc-csem.org/#2), the epicentre is at about 10 km below seabed south west of Zakinthos ( 37°37'200N 20°16'800E ) but no damage nor injuries is reported. The quake was felt at Lefkas. After four days dry but relatively cool weather the very wet and windy program is back. A deep depression brings heavy rain and strong wind, south and west winds to 30 kn The whole country but especially the Pelopponesos is affected by water damage. 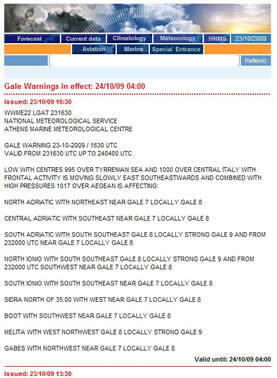 The strong wind field keeps temporarily ferries ashore in Lavrio and Rafina, and in the Ionian and in the Aegean Sea. 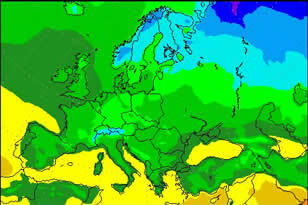 What kind of weather we have here now - and we had the previous weeks? A quite simple answer, the weather of a real poor Belgian summer! August 2006. The end of a really poor summer. We are on the return trip from the Channel Islands to Nieuwpoort. The meeting on the Iles Chausey with our French friends, Jack and Françoise could not happen: they have been waiting a long time in Saint-Malo for the strong wind easing and better weather while we were defying the to prominent rain on Guernsey ... and re-discovering the island for the third consecutive year, by bus! But this year we are more prudent and we return earlier. Yet the weather is holding us longer than we expected: in Saint-Vaast-la-Hougue - which is nót a punishment with a "plateau de fruits de mer" from l'Océane fish-shop -, and in Dieppe, 5 days ... But in Greece - and next year it will be the start of our project -, there it will be different ... A very, very long fore- and after season, that's what we hope ... The climate statistics of Weather-on-line have increased our optimistic expectations. 11.11.09: Alfas Marina. At 11H51(09H51 UTC) a new earthquake 5.1-5.4 on the Richter scale reminds us that the earth crust here is always submitted to very important tension as this zone is one of Europe's most seismically active. The quake has his epicentre at 10 km depth in the Ionian Sea in pos. 37°33' 000N 20°16' 200E; there are no reports of injuries or damage. Is it in fact not for this weather, also, that we had dreamed - under the drizzle of the North - about "these nice autumns in Greece "? Last week, as to celebrate the return of the good weather, at Artiria, this fascinating cultural centre situated in the marina, jazz rang till late in the night. 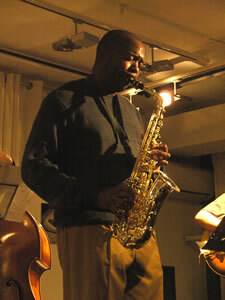 Craig Bailey, former saxophonist of Ray Charles, accompanied by three Greek musicians, on tour in Greece, gave a concert. Melodies in the grave sounds, sometimes melancholic, alternated with lively accents of bossa nova, and the peaceful humour of the jazzman had quickly conquered the assistance! But the public got also strong enthusiastic about the performance of the Greek drummer, the very applied performance of the bassist and the personal style of the guitarist. a new, too brutal cleaning of the underwater hull by high pressure in the spring - the waterline still has the marks of it! -, an intervention by a brush is imperative. And the list becomes still longer: maintenance of the engine, waxing the hull, cleaning the water tank, treatment of the reservoir of waste water, removal of the sensor of log (a boring job in our boat! ), rinsing the outboard and draining its carburetor, cleaning and treatment of the dinghy, check of the seals of the teak deck, cleaning of the stainless steel, and ... the list seems endless! 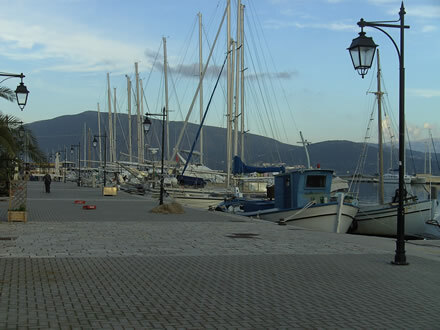 01.12.09: Lefkas Marina. Slowly the high pressure is weakening, allowing the perturbations associated with zones of low pressure on the West and the Northwest of Europe to approach Greece. The weather forecasts are relatively pessimistic: rain, thunderstorms and strong winds of the South will be in the menu, this week! Should the marina also be a victim of this more than gloomy general economic and financial situation ? Some signs could be revealing. Fact is that the public quay is this year well occupied, that in Nidri and in Vliho there are no more berths available at the quay, that at the anchorage of Tranquil Bay much more boats are wintering afloat. In Marina Lefkadas, there are three bars with terrace, and a hotel. Two bars used to close once the season of (charter)boats ending. The third, Il Porto, open all year long, is well frequented during the winter on beautiful days and during the weekends. 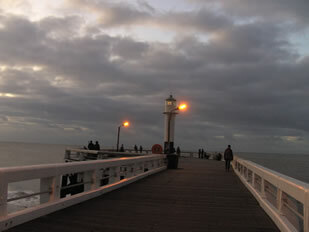 It is also the meeting place of the live aboards, mostly British sailors. They organize a.o. every Friday evening a meeting and also a weekly ladies-coffee there. Charles Laughton and Maureen O' Hara in Jamaica Inn (1939), Lawrence Olivier and Joan Fontaine in Rebecca (1940) - according to the novel of Daphné du Maurier -, Ingrid Bergman and Gregory Peck in Spellbound (1945), Gary Grant and Ingrid Bergman in Notorious (1946), Gregory Peck still in The Paradine Case (1947) with Ann Todd and Anida Valli. Previous week the short films were in the poster: Iraqi, French, Czech and Lebanese short movies. Artiria also organized meetings with writers and philosophers but, alas, our knowledge of the Greek language being limited to some basic words and expressions, we shouldn't have understood a word! Year of very serious economic and social consequences, with on the background an international financial crisis provoked by incredible guilty irresponsibility, 2009 also saw appearing fears of pandemic among which a too wide part of the humanity was imaging to be safe from. 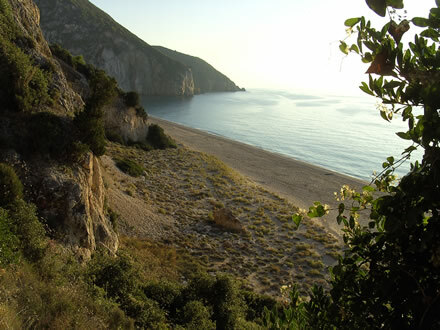 Lefkas was, until now, in fact, spared by the virus H1N1. In Greece the vaccination campaign begins - a little bit late - on December 12th, firstly for the risk groups ... while 80 % of the population says itself opposite to the vaccination! But Christmas and New Year are approaching. 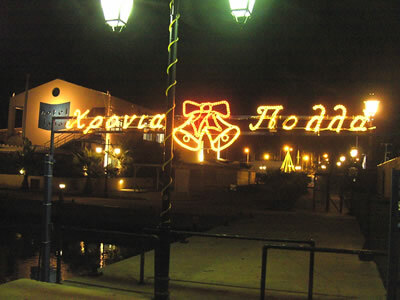 The Christmas lights appear, already, here and there;also in the marina. So, will the atmosphere and the hearts participate in these too much programmed holidays, or, and that would be wiser, finally, will be these holidays, enclosing this annus horribilis, a soft incitement in a reflection leading to a more rational and more ecological world? 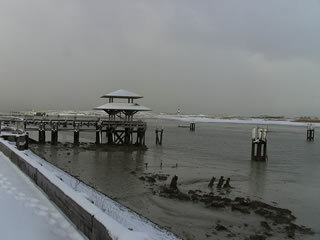 Nieuwpoort. 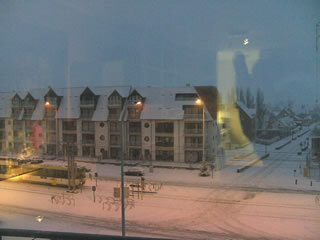 The snow arrives in the night of December 16th to 17th. At dawn we contemplate a white carpet: finally we begin to realize that we have returned home for some weeks. Olivier was waiting for us at the station: the reunion was warm, we had so much to tell since Hortó, in spite of our regular phone calls. To finalize the purchase of the new car - nevertheless perfectly prepared by Olivier - we had to do numerous goings and comings ... finally some hundreds of kilometres! So, then we knew really that we were back home! Snow. Slippery roads. The record of the length of traffic queues is broken. In all West - European airports reigns a real mess: for the very numerous travellers a disappointing start of Christmas holidays. Eurostar trains have a breakdown in the Channel Tunnel. TV shows thousands of angry people, stuck, constrained in waiting for many days and seeing how the dream of nice city trips is transformed into nightmare. The river Zenne, then the river Dender are struck by a very important pollution: Ecolo-minister Evelyne Uyttebroeck must suffer for it but she defends herself with pugnacity. The water-treatment plant of Brussels-North was stopped by Aquiris, the developer, because of waters too much loaded with rubbles. The pollution extends. Flanders lodges a complaint and assigns in justice. In Copenhagen, the summit on the global warming is reaching a deadlock.